Jakarta, August 13th 2015 - Continuing to expand the successful favehotel brand in the Indonesian capital, Archipelago International announced the opening of the favehotel Zainul Arifin in Jakarta's Chinatown. Home to over 15 million people, Jakarta is a huge megalopolis and one of the world's largest cities. It is a city of contrasts; the traditional and the modern, the sacred and the worldly. Its population comprises of all ethnic groups in the Indonesian archipelago, living under the national motto: Bhineka Tunggal Ika, meaning "Unity in Diversity". The new favehotel sits near Chinatown on Jalan Zainul Arifin and affords easy access to the North and Central Jakarta business districts, old Batavia and the many government offices around the Presidential Palace. With this convenient location, favehotel Zainul Arifin aims to be a prime choice for business and leisure travelers, wanting to explore the heart of Jakarta and Chinatown. The 84 super clean and contemporary budget hotel rooms feature top of the line beds with a plush mattress, down pillows, a cozy duvet and crisp 250 thread-count sheets â€“ together with smart touches that contribute to a comfortable and enjoyable stay. Free high speed WiFi throughout the hotel keeps guests connected while the flat LED TVs in the rooms offer 60 local and international channels including choices for 5 different languages. The hotel's eclectic coffee shop serves a simple but hearty breakfast and many light and healthy choices throughout the day. Elsewhere in the hotel, there is also a selection of top-class meeting facilities for business travelers. With its slogan of "Fun, Fresh and Friendly", favehotel Zainul Arifin is committed to ensuring guests a comfortable stay. The friendly and attentive staff will be on hand to assist guests throughout their stay eager to offer assistance with guests' excursions by sharing their knowledge and experience of the surrounding area and its sights, including the nearby National Museum and National Monument. "Jakarta is such a diverse capital city, with locals and tourists from across the world exploring its culture, doing business in the financial district and enjoying the plethora of dining, shopping and entertainment options. favehotel Zainul Arifin caters to these different types of travelers, with its great central location, friendly staff and premium facilities. We are very excited to be adding this new favehotel to Archipelago International's ever-growing portfolio in the capital". Said John Flood, Archipelago International's President & CEO. 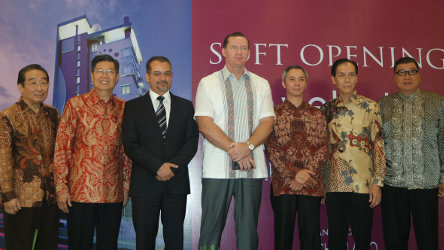 Seen in the image from left to right - Mr. Djohan Kosasih as Director of PT. Graha Sarana Wisata, Mr. Yongki Purnomo as Commissioner of PT. Graha Sarana Wisata, Mr. Norbert Vas as Vice President Business Development of Archipelago International, Mr. John Flood as President & CEO of Archipelago International, Mr. Joezar Rinaldi as Hotel Manager of favehotel Zainul Arifin - Jakarta, Mr. Bianto Husin as Vice President of PT. Graha Sarana Wisata and Mr. Hartono Angsana as Commissioner of PT. Graha Sarana Wisata during the Soft Opening ceremony. Seen in the image - Balloon released as a mark of favehotel Zainul Arifin's Soft Opening. favehotels currently operates 36 hotels throughout Indonesia and Malaysia out of which 12 are in Jakarta and 5 in Bali and has a development pipeline of more than 40 hotels in Indonesia, Malaysia and the Philippines.